Our good friend, and frequent contributor, Jennifer shares her experiences at Disneyland on her latest trip in February 2015. She and her Mum have multiple food allergies and severe intolerances. Tip: Order safe treats delivered to your hotel (the day or two before you arrive) and bring some with you into the parks each day. They sell fresh fruit at many carts throughout both parks – a safe snack. Or, there’s a Walmart close to the park that you can stop at for snacks to bring into the parks with you – we had bananas and apples, mostly because I am unfamiliar with what other snack items would be safe in America. WestJet (airline) – The travel agent marked my allergies on my ticket when booking our flights. Before boarding, I was paged to the gate to confirm my allergens and they made sure I had my auto injectors on my person. On the plane, the flight attendants asked me again to confirm my allergens, that I had my autoinjectors, and then asked whether I wanted a buffer zone or full plane announcement made. (On the flight home I was only given the option of a full plane announcement.) Announcements were made and all was good. Plaza Inn (character breakfast, Disneyland) – The chef came out to take orders for those with allergies. The selection was fairly limited but the chef brought out plates heaped with safe foods: Mickey waffles (contain dairy), bacon, sausage, fruit, potatoes, tomatoes. (Alas, their regular waffles contain dairy and their gluten-free waffles are made with a mix that may contain tree nuts and sesame.) Characters were abundant: Minnie, Pooh, Tigger, Eeyore, Max, Fairy Godmother, Hook, Rafiki. We had reservations for as soon as the restaurant opened for Early Magic Hour. Our 4-day park hopper included an early magic hour morning but we did not have to use it for this morning as those with breakfast reservations have a special entrance to the park. This let us use our early morning another day. Be sure to use the breakfast entrance if you have reservations! This is a very good option if you wish to visit characters without waiting in queues, as the characters come to you, interact with you, and you can have your photos taken (with your own camera). PhotoPass+ – Absolutely recommend this!! We had 400+ photos in only 4 days. Order this online ahead of you trip (minimum 14 days before) to receive all of your character meal photos, ride photos, photographer photos, and stock photos on CD for $65 (I think). Best deal ever! If you wait until you get to the park, this same package is $100. Still worth it, but pre-ordering offers HUGE savings. (The character breakfast photos alone were $35, or free when included with the photo package.) We had our character breakfast on the first morning we were in the parks, when the photo shop was closed. The photographer at the restaurant was able to activate our PhotoPass+ package and give us our card to use for our stay. You can also merge PhotoPass cards together onto your PhotoPass+ account, so if your group separates you can still have all your photos together. DEFINITELY get this package, and do so 14+ days ahead of your trip!! River Belle Terrace (Fantasmic! dinner package, Disneyland) – Per usual, the chef came to our table to discuss the menu options that would be safe for allergies. The food was just okay – similar to quick service food quality. The dining room was VERY noisy due to poor acoustics. It was difficult to enjoy a quiet meal there. The FastPass tickets for Fantastic! were well worth it, as the dining package guests have a reserved area front and centre with an amazing amount of room. We stretched out and had plenty of room to watch the show with clear line of sight. The best way to watch Fantastic!, for sure. Blue Bayou (inside the Pirates of Caribbean ride, Disneyland) – Again, the chef came out to discuss our options. The food quality was excellent. The marinated mushroom with cous cous was safe for all allergens and special diets in our group. 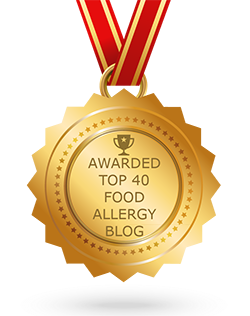 The bread was safe for sesame and peanut allergies – a rare treat for my mother! Wine Country Trattoria (California Adventure) – We mentioned allergies and were immediately given allergy menus, listing the dishes that are safe for various allergens. Chef Sean came out to talk to us and review menu items, including some that weren’t on the safe list but turned out to be safe if the bread was left off (for instance). He spent a long time at our table and mentioned how he and another chef were in charge of menu development and stressed over the allergy menu, wondering whether it would be helpful and insisting that people with allergies talk to the chef, even after reviewing the menu in case something had changed. The chefs make allergy meals themselves and take extra care to prevent cross-contact with allergens. Chef Sean was amazing and the food we had was incredible! Steakhouse 55 (fine dining, table service, Disneyland Hotel) – Breakfast here is very reasonably priced, the portions are satisfying, and the service was impeccable! Once again, the chef came to our table to discuss the many options available. The chef and server came out several times to confirm every ingredient, verify preferences, and customize our order to meet every need and request. I highly recommend dining here for breakfast. We’ll definitely dine here on our next trip – frequently, if time permits. Tip (not really a tip, but more of a critical instruction to follow to keep your sanity): GET TO THE PARK EARLY!!!! I know that’s a given with any Disney park, but the entrance area at Disneyland is really crowded from opening time until about two hours later. As in extremely crowded parking lot of people. It’s mad really. Just arrive 15-20 minutes before park opening and you’ll walk right in with little to no queue. (Plan to arrive 30 minutes early to get through bag check.) The entrance area is shared between the two parks, so it’s twice the amount of people in one small area that turns into a zoo of really long queues. No thanks. Jennifer also recently visited Disney World and reviewed restaurants there, too. 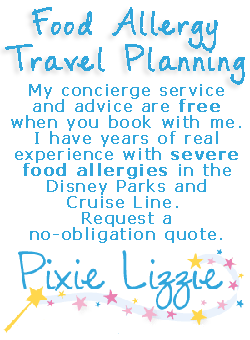 You may also want to read Jennifer’s Disney Cruise food allergy tips and her latest Disney Dream food allergy review, too.